Sunnyside Dru: what to plant? Should you decide to grow plants from seeds in your own garden, how do you decide what to plant, and how many? We grow for more than just us. We plant for a 40 member CSA, and work to deliver an average of 8 items each week. 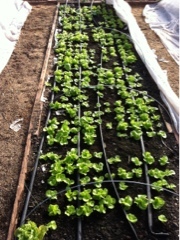 An example: a bunch of carrots, radishes, beets, lettuce, spinach, chard, herbs and peas. Folks want 8-10 carrots each week. For cooking, eating out of hand, shredding into cakes. How can a grower know how many have been planted? So that week by week a family gets enough, but not too much. Carrot seeds are the tiniest seeds ever. A usual single packet holds 3,000 carrot seeds. What does that mean? Does every seed go in the ground on the same day? Will that result in tough carrots at the end of the season? And if, planted too close, will the harvest be carrot dental floss? If too far apart, will the result be a bed of weeds? As growers, the numbers each week, and how to know what they are, has been frustrating. Thinning and weeding are certain to bring on carpal tunnel if we are able to produce the right number of carrots: a little more than 10,000 each year. And the tiny seeds are impossible to place, they stick to fingers and end up bunched up or not there at all. Against the dark dirt the seeds are impossible to see. And carrots are always tough to start, taking several weeks before sprouting while the weeds grow strong around them in a freshly planted bed. Homer had enough. For years he worked in metal: sometimes a completely custom, one time object for NASA or military subcontractors. Sometimes in production where a piece needed to be exactly the same, in quantity, for years. He trained in metal work, precision sheet metal, with his father. And as he tells it, a bunch of other old guys who teased him relentlessly, advised him when he was making something backwards to stop and think before advancing, and who also taught him hundreds of tricks to get things made. Knowledge those men had learned over decades: how to keep all of your fingers when working with heavy materials, sharp blades, several ton presses. Homer spent time working for a company that made hundreds of prototypes for all kinds of use. The engineers would say "all this stuff needs to be fit into something, please do that" and back and forth they would work, until the thing could be put into production, where he helped figure out best and fastest practices. Things changed. Computers became more powerful. Able to put 3D into use in design, slowly eliminating the need for prototypes. Data could be manipulated rather than materials. Dimensions of components were fed into computers, and manufacturing/tooling/layout guidelines spit out. The most interesting: the trigonometry, the visualization, the how best to lay out patterns so the least waste and most used of materials work slowly became a very small part of his time. He was asked to take programming classes, and in classes with engineers he could always write the program and get it to produce the assigned shape or cutting pattern the quickest. He was told of promotions in his future, of a desk job. One spot all day long everyday. Sheer torture to a man used to moving all day, rarely sitting, and with a keen and active mind. He switched work. Started building custom furniture. More than one person cried when he completed a job "so many looked at this and said no way, and here you have it finished, beautiful". And then farming. A desire to eat better. And those pesky carrots. And lettuce. And beets. Those tiny little seeds. And a love of having 2 working hands as needed, avoiding carpal tunnel from that same, repetitive motion of seeding beds, trays, pots. Of thinning the too crowded seedlings as they sprout. Of weed pulling. And finally of harvest. Every motion, every 10,000+ carrot seeds and all the rest of the vegetables. Thousands of weeds to pull with the same hand position. There has to be a better way. For years he has tried many things, different methods and materials to reduce time spent, increase accuracy, decrease weeding and produce a known number of each, week after week. What he has figured out has been called, by 2 people in the last few weeks, a game changer. Always our goal is to keep ourselves out of debt while producing what makes our CSA members happy. And to farm without fossil fuels, without expensive, debt inducing equipment. Vegetable production accurately while blocking weeds. Using simple, low tech equipment. Made in America. And to share that knowledge with other growers. We submitted his plans to Kickstarter. To offer his Speedy Seeder to people all over the globe. Nope they said. Not the kind of thing we do. Rewritten and resubmitted. Close they said, but not there. Rewritten and resubmitted. Accepted! Video reviewed by friends in the business, who say "wow, the sound is awful but I get it, I understand what it does and see the value, this thing is a game changer". Miles to go still. Launch will be January 2, and run for 40 days. Legal, website, production, instructions, packaging for shipping, labels, UPS accounts, Amazon clearances will all be finalized if we get to goal in February. Anticipated delivery end of March. If we hit goal. While certain we are missing some details, maybe we are close to covering most things. Homer even designed The Speedy Seeder to fit in a standard size box, built by a local box maker so we can just go get stacks of them when (if?!) we need them. 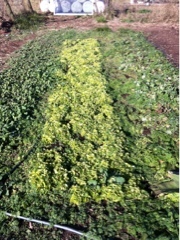 These photos show an example of lettuce planted with and without The Speedy Seeder. Fingers crossed. We want everyone growing from seeds. It feeds bees, feeds us. If it is easier, less time consuming and trumps the weeds maybe more people can have victory gardens. We can dream, right?